I mentioned at the start of 2015 that there were going to be a LOT of skincare product innovations this year. Here's another I know you're going to be just as excited about as I am. 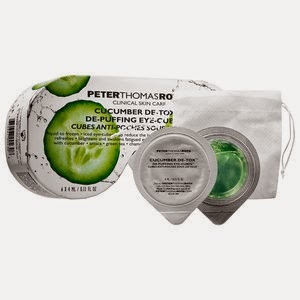 Peter Thomas Roth Cucumber De-Tox™ De-Puffing Eye-Cubes may just become my new beauty "best friend" after a late night, or an early morning wake up before traveling! The pack contains 6 of the Eye-Cubes, which each come in their own pouch. They come in the pack in liquid form, and then all I had to do is put them into my freezer. Within a few hours they freeze into the soothing ice cubes. All I had to do was take the cube out of ti's pouch and then gently glide it back and forth under my eye area. I switched between eyes about every 10-15 seconds, as they were very cold. 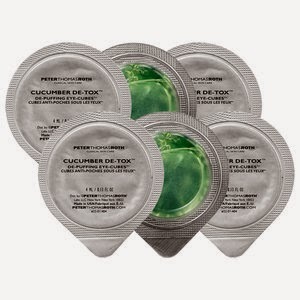 Each cube is not just filled with Cucumber extract and Aloe Vera, but also Arnica, which has skin healing properties and helps fade dark circles, as well as caffeine, which increases blood circulation and also helps reduce dark circles.